« Person, place, or thing? I can’t decide whether I like the picture of your mom blanketed with cats or the view from the yard batter… what a great place! Hope your new year was a good one. Blanketed with cats – good one! It really is a great place. You’d like Seattle a lot. I wouldn’t say the actual New Year’s eve/day was all that great but I’m hoping 2011 will be a good year! I was there once as a kid, briefly, on our way to the Canadian islands up there. 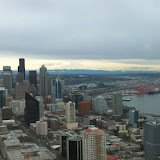 I remember the Space Needle and not much else, but I’d love to go back! As for your previous post: I think uncertainty is built in, so maybe take comfort in the fact that we’re supposed to be that way from time to time? At least I get spells of it. And 2011 will be good, if we will it so!